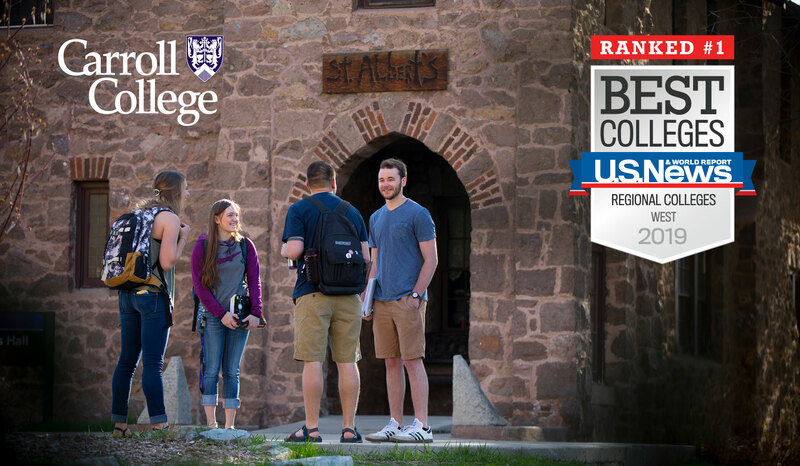 For the eighth straight year, Carroll College is the top rated Regional College in the West as ranked by U.S. News & World Report. HELENA, MT – For the eighth straight year, Carroll College is the top rated Regional College in the West as ranked by U.S. News & World Report. Carroll once again earned a perfect score of 100 with the 2019 rankings providing data on over 1,800 schools. In addition to the #1 ranking for Best Regional College in the West, Carroll was selected #3 for Best Value College in the West, ranking in the top three for three years in a row. Carroll also retained the top standing for Best Regional College in the West for Veterans for the fourth year in a row. New for the west this year is Carroll’s #1 regional ranking for Undergraduate Teaching. This new category recognizes schools where the faculty have an unusually strong commitment to teaching. The “Best Colleges” rankings, released annually by U.S. News & World Report, provide one of the most comprehensive and reputable assessments of over 1,800 regionally accredited institutions compared on a set of 16 measures of academic quality. Among the factors measured in the rankings are how well schools retain and graduate students, assessment of excellence from academic peers, the quality of and investment in faculty, admissions selectivity, financial resources and alumni giving. View the methodology here.